in St st; 22 sts and 26 rows = 4" in Twisted rib patt. 26-st cable panel measures about 4 1/4" wide. 36 (37 3/4, 41 3/4, 45 3/4, 49 3/4)" bust circumference. Pullover shown measures 36", modeled with 3" of positive ease. Finished Size 36 (37 3/4, 41 3/4, 45 3/4, 49 3/4)“ bust circumference. 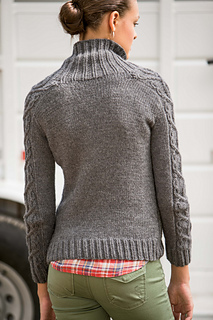 Pullover shown measures 36”, modeled with 3” of positive ease. Yarn HiKoo Simplinatural (40% baby alpaca, 40% fine merino wool, 20% mulberry silk; 183 yd 167 m/3 1/2 oz 100 g): #100 slate grey, 6 (7, 8, 8, 9) skeins. Yarn distributed by Skacel. Needles Size 8 (5 mm): 16” and 32” circulars (cir) and set of double-pointed (dpn). Adjust needle size if necessary to obtain the correct gauge. Notions Markers (m); cable needle (cn); stitch holder; tapestry needle; three 1” buttons. Gauge 18 sts and 26 rows = 4” in St st; 22 sts and 26 rows = 4” in Twisted rib patt. 26-st cable panel measures about 4 1/4” wide. 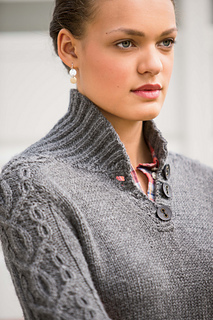 Wear the shawl collar upright in this menswear-inspired, saddle-shouldered Hitch Pullover. 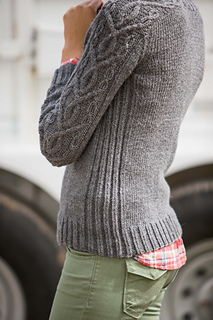 A wide cable runs down the sleeve, while twisted rib creates definition at the sides of the body.